'Gems Of The NWOBHM’ sees those loveable Roxxcalibur rapscallions romping through another clutch of classic covers from the days when men were men, jackets were leather and trousers were stripy. As with their previous outings – 2009’s ‘NWOBHM For Muthas’ and ‘Lords Of The NWOBHM’ which followed a couple of years later – vocalist Alexx Stahl, guitarists Kalli and newbie Holger Goater, bassist Mario Lang and drummer Neudi have once again eschewed the obvious and dug deep to unearth the (long-forgotten) gems of the album’s title: that said, there is a loose theme to the running order, in that the songs they’ve Roxxcaliburised this time around are either drawn from singles or compilation albums. You can argue all night about what’s the best song on the album, and believe me, I have. Roxxcalibur have spread their net far and wide, both geographically – from Jersey’s Legend to Dundee’s Satan’s Empire – and musically, and have rounded up a stunning collection of originals to pay homage to. If you want a full track list you’ll have to splash some cash on the album, but for my money the killer cuts are ‘Paper Chaser’ and ‘Soldiers Of War’: both were originally the product of one-hit wonders, ‘Paper Chaser’ being Taurus’s contribution to the BBC ‘Metal Explosion’ LP and Satan’s Empire’s ‘Soldiers Of War’ closing the Neat Records’ ‘Lead Weight’ compilation. As ever, the Roxx gang have toed a fine line between a straight rehash (albeit with better production) and making too many changes, but if you can’t leap like a loon as the guitars cut loose in ‘Paper Chaser’ there’s a fair chance you’re dead. Elsewhere, covers of Eighties’ offerings by Legend, Virtue, Trespass, Mythra, Split Beaver, Aragorn, Smokin’ Roadie and Fist all stand shoulder to shoulder, and bonus points are added for the way the band have reworked the keyboard parts in ‘Somewhere Up In The Mountains’ (originally recorded by Marquis De Sade in 1981) and White Spirit’s ‘Midnight Chaser’. And although purists might blanche at the inclusion of Budgie’s ‘Panzer Division Destroyed’, particularly after a scathing TV interview Burke Shelley once gave in which he derided everything and anything about metal, in its defence the ‘If Swallowed Do Not Induce Vomiting’ EP from which the track is drawn rode the crest of the NWOBHM’s rising popularity in 1980 and in doing so pretty much relaunched the band. And besides, it’s a cracking song too. Back when these songs were first recorded they were often make-or-break throws of the dice by young hopefuls eager to make a living out of music. 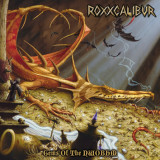 That some thirty-five years later Roxxcalibur can breathe life into them once more purely for the fun of it shows just how enduring the songs of the NWOBHM are. So, full marks to both these five NWOBHM-obsessed Germans who keep the flag flying, and the NWOBHM musicians who worked long and hard to be able to finance a trip to the recording studio all those years ago. We salute you!